From the Food Network to the White House, today’s celebrity restaurateurs are lauded for their localism, creating seasonal menus around their own gardens or buying exclusively from nearby farms. But can these twenty-first century culinary visionaries also fix your car, play host to your elephant, and tow your plane out of a ditch? 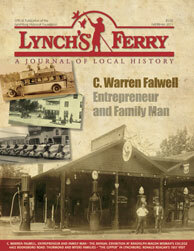 In this charming childhood memoir, author Pee Wee Falwell takes Lynch’s Ferry readers directly “to the top,” to the unassuming man seated at the old roll-top desk. Philip Thurmond’s family owned a chauffeur-driven limousine. But the schoolboy lingered on the trolley, helping the conductor flip the seats in preparation for the reverse ride back to town. This portrait of the Thurmond-Myers family provides a century-long peek in the windows of the Colonial Revival red-brick house at the junction of Boonsboro and Trents Ferry Roads. This essay covering Reagan’s twelve-hour tour of the Hill City depicts a man in the process of transitioning from the silver screen to the White House. At least, that’s what we know in retrospect. The pictures tell another story: “There were fans all around him trying to get his autograph—many of them were female, as you can imagine” recalls Jean Litchford. Thanks to Nate Sullivan for bringing us a long-lost local treasure.